Researchers from the international Past Global Changes (PAGES) project write in the journal Nature Geoscience that they have identified an unprecedented, long-lasting cooling in the northern hemisphere 1500 years ago. The drop in temperature immediately followed three large volcanic eruptions in quick succession in the years 536, 540 and 547 AD (also known as the Common Era CE). Volcanoes can cause climate cooling by ejecting large volumes of small particles – sulfate aerosols – that enter the atmosphere blocking sunlight. A later “Little Ice Age” between 14th and 19th centuries has been well documented and linked to political upheavals and plague pandemics in Europe, but the new study is the first to provide a comprehensive climate analysis across both Central Asia and Europe during this earlier period. “With so many variables, we must remain cautious about environmental cause and political effect, but it is striking how closely this climate change aligns with major upheavals across several regions,” added Büntgen. The multidisciplinary research team made up of climatologists, naturalists, historians and linguists mapped the new climate information against a particularly turbulent period in history in Europe and central Asia. The volcanic eruptions probably affected food supplies – a major famine struck the region at precisely this time followed immediately by the pandemic. Further south, the Arabian Peninsula received more rain allowing more vegetation to grow. The researchers speculate this may have driven expansion of the Arab Empire in the Middle East because the vegetation would have sustained larger herds of camels used by the Arab armies for their campaigns. In cooler areas, several tribes migrated east towards China, possibly driven away by a lack of pastureland in central Asia. This led to hostilities between nomadic groups and the local ruling powers in the steppe regions of northern China. An alliance between these steppe populations and the Eastern Romans brought down the Sasanian Empire in Persia, the final empire in the region before the rise of the Arab Empire. The temperature reconstruction, based on new tree-ring measurements from the Altai mountains where Russia, China, Mongolia and Kazakhstan meet, corresponds remarkably well with temperatures in the Alps in the last two millennia. The width of tree rings is a reliable way to estimate summer temperatures. The research is part of the Euro-Med2k working group of the international Past Global Changes (PAGES) project. Last week, (29 January 2016) members of the group published a comprehensive analysis of summer temperatures in Europe in the last 2000 years, concluding that current summer temperatures are unprecedented during this period. 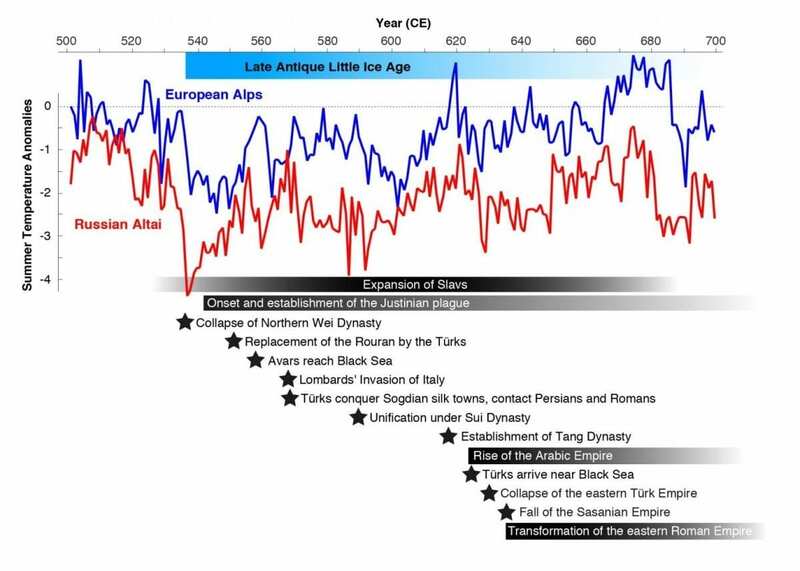 The Euro-Med2k Working Group reconstructs and models past climate in the Europe and Mediterranean regions (including southern Europe, the Middle East and northern Africa) over the last 2,000 years. PAGES is part of Future Earth – a major international research program to study global sustainability.